Sunlight dancing through the palms, pastel Cadillac coupes; sun-kissed ladies sipping ruby red Daiquiris, matching the hibiscus flowers in their hair-these are but a few of the images that awaited travelers to Havana during the height of mid-century glamour. Throughout the 1950s, Cuba was a premier vacation destination for tourist from all over the globe. Millionaires, movie stars, bohemians, and romantic couples alike flocked to the island-nation paradise. While revolution was brewing in rural Cuba, the capitol city was alive with a very different kind of hysteria. By day, couples would race through Havana’s streets, watching the morning light bring the city’s Spanish architecture to life. 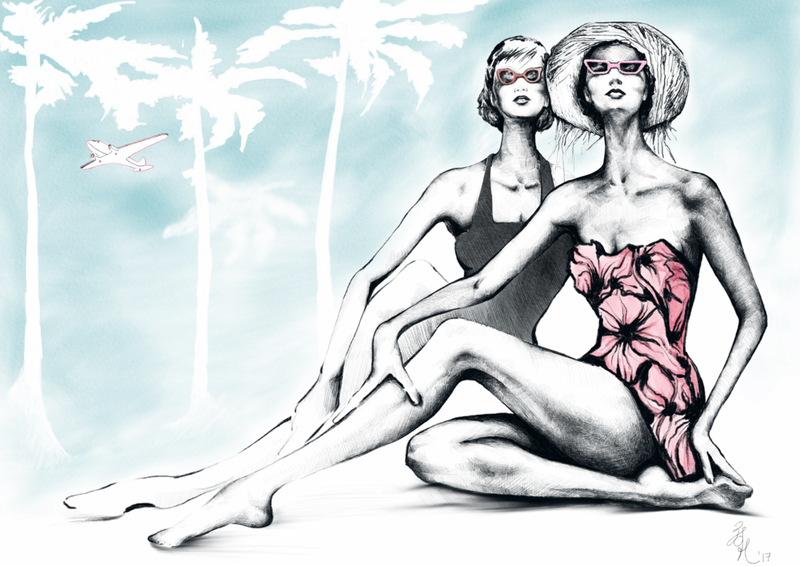 On the island’s beautiful beaches, ladies sipped rum cocktails while lounging in floral print, Jantzen bathing suits. By night, Ernest Hemingway held court at the famous La Floridita-throwing back cocktails and entertaining fans with wild stories. Socialite couples dawned elegant evening attire to mix it up with celebrities like Ava Gardner and Frank Sinatra at city's casinos, clubs, and cabarets. Havana was a true garden of glamorous delights, and once again, it’s rising in the cultural zeitgeist. Warming summer temperatures have brought a renewed interest in the romantic paradise that once was-so feast your eyes on the- “Flowers of Havana”.